Hotel Moti Palace offer’s comfortable and quality accommodation with distinctive features at reasonable rates, guarantying better than the best service, providing you ever lasting memories. Your support will render us in achieving new heights in Hospitality Industry in this part of the world. 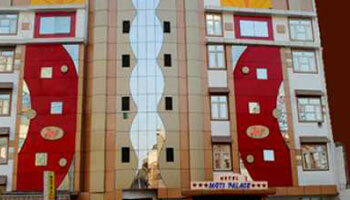 Our motto is to provide the best services to guest coming to ‘The City Of TAJ’. We wish you to be our business partner and help us in reaching the desired excellence and seek your support forever. Laundry Facilities, Parking, Breakfast Services, Doctor on Call, Airport Transportation, Currency Exchange, Security Guard, Travel Counter, Room Service, Backup Generator. Attached Bathroom, H/C Water, Cable/Satellite TV, Wakeup Calls, Toothbrush/Razor on Request, DVD Player, Iron/Ironing Board, House Keeping, Air Conditioning Room.